Real Pa Kua Chang will create The Golden Sphere! Most people, unfortunately, don’t know of The Golden Sphere, have not heard of it, and are not blessed with even the rudimentary knowledge of how to attain it. Yet the Golden Sphere is nothing but a manifestation of energy, a glow manufactured and sustained, and the rules for that attaining are simplicity in itself. Indeed, with a bare outlining of the basics necessary, any one of any art could attain it, though, to be honest, it is easier if one has acquired all the knowledge, and studied all the arts. First and foremost is the grounding of the machine that is your body. 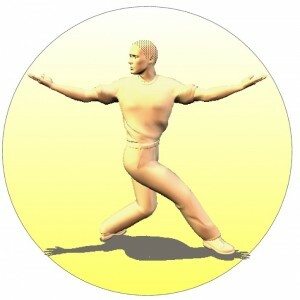 You must undertake a severe study of stances, through all potential ranges of motion. You must run the energy up and down the legs, learning when to brace against the ground, and when to liberate yourself from it. Second and equally important is the glow of the energy center. This energy center is called the tan tien, or the One Point. This energy center is actually an energy generator, and you must breath as if to it, center your awareness on it, cause it to glow from the excitation of energy running up and down the legs, make it work. Third, most critical of all, one must learn how to relax while doing the martial arts. If one is not relaxed, then energy is not concentrated in the tan tien, but rather dissipated throughout the body to points that are not relaxed. In other words, energy is locked up by points of the body that are not relaxed. Now, you are grounding, focusing, breathing, and creating truckloads of energy within the center of the body. You will glow, regardless of any wish or desire to the contrary– and only a fool would not want to glow in this fashion. So liberate this energy, course it through the arms, and like sparklers on a dark night, surround your body with geometric configurations of energy, and let that energy encapsulate you, protect you, and yet not bar you from the world, but rather open you to a different world, a world beyond senses, a world of ethereal perfection. Eventually, as you practice endlessly and without thought of time or other such mundane limitations, you become art. You become the unique and special individual you are. One thing that will help unlimit you, and increase your progress in this quest a hundred fold, is to study what virtue is, and how to manifest it in your life. It is easy, you know, if you just get out of your way, if you do your forms with attention to the details I have listed here. It is easy if you put aside the problems of the world, solve them quickly and efficiently, and consecrate your time on this planet to what really matters, the creation and evolution of art. I advise you then, do what I have instructed here, and…and to do it through the learning of as many arts as you can, for to seek The Golden Sphere through but one art is slow, to seek it through understanding all is The True Way. There are three simple but complete systems in the very real Pa Kua Chang course offered at Monster Martial Arts.